Israelis are due to cast their votes on Tuesday in an election that could end Benjamin Netanyahu’s astonishing 10-year uninterrupted run as prime minister. Or he will be re-elected, virtually guaranteeing him the title of Israel’s longest-ever serving leader. When will we know the result? Voting will take place on Tuesday and exit polls will come in at 10pm (8pm London time). By dawn on Wednesday, there is likely to be a clear winner. That does not automatically create a new government. Israel’s political system is based on delicately formed and unstable coalitions crafted by a majority of the 120-seat Knesset. Once an election winner is known, the president will start consultations to see which party has the highest chance of forming a coalition. In 2015, it took Netanyahu more than a month to play the political game and gather enough seats. More than anything, the election is viewed as a referendum on Netanyahu and where he has taken Israel since he first rose to high office in 1996. Supporters of “King Bibi”, as he is known, claim Israelis have never been safer while enjoying a booming economy. At the same time, the 69-year-old has all-but-buried the country’s peace movement, and millions of Palestinians remain under oppressive, tightly-managed military control. Israel under his tenure has swung dramatically to the right, squeezing critical voices while further sidelining and demonising minorities. He has pursued foreign relations with authoritarian strongmen and fell foul with Israel’s more liberal supporters. One critical development that has alarmed even his staunchest backers is that Netanyahu has courted some of the most racist figures in Israeli politics to keep his seat. Running in a tight race for re-election, a Netanyahu win could bring more extreme far-right voices to power. Netanyahu made an election pact with a party of ultranationalist extremists called Jewish Power. They merged with other right-wing factions to forge a more powerful bloc that would give Netanyahu a better chance of forming a government if he wins. Jewish Power, whose politics even the largely uncritical pro-Israel lobby Aipac deplores, are ideological successors to the militant former rabbi, Meir Kahane, whose movement was banned by Israel and the US under anti-terrorism laws. Kahane’s modern-day followers have called homosexuality a “disease” and argue for the forced expulsion of Palestinians, including those with Israeli citizenship. What are the main issues in this election? A recent poll conducted by the Israel Democracy Institute found that the socio-economic factors are primary, while the personality of party leaders come in second, followed by foreign and defence issues. But there’s a big wildcard this year: corruption cases against Netanyahu. The prime minister is running under a genuine threat of indictment in three separate graft investigations. Both the police and the attorney-general have said they believe he should be charged. If he is re-elected, a pre-trial hearing in which he can defend himself will taint the first months of his fifth term. One case involves allegations of receiving gifts, including pink champagne and jewellery, from international billionaires allegedly in exchange for favours. Another swirls around claims of collusion with the country’s top-selling newspaper to hurt its competition in exchange for favourable coverage. The third and most serious case accuses Netanyahu of offering incentives to the Israeli telecom provider Bezeq in exchange for positive stories in an online news website it owns. Netanyahu denies all the charges, which he portrays as a political witch-hunt. Are his political rivals using this against him? Netanyahu’s main contender, the only person seen capable of taking him down, is betting on it. 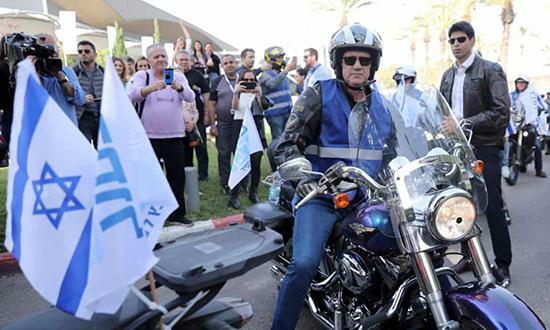 Benny Gantz, a 59-year-old former army chief running a centrist party called Blue and White after the Israeli flag, has climbed in the polls. He has almost no political experience and few concrete policies but hopes to appeal to voters by playing up his “clean” image compared to the country’s leader. Gantz has argued that Netanyahu has sowed division and battered state institutions such as the police and judiciary to stay at the top of government. Hard to tell. Polls suggest the initial excitement over Gantz has faded somewhat. But Israeli polls are not reliable. Many people say they have not decided who to vote for. What about the Palestinian issue? It was not featured prominently, sometimes not at all, on the campaign trail. While in past elections, peace with the Palestinians was the central factor for voters, it has effectively disappeared. Israel’s government has further isolated Palestinians in blocked-off enclaves where most Israelis never visit. Meanwhile, international pressure to end the occupation, especially from the US, has dropped off.